I heard a conversation last week between two workers that I found rather disturbing. What was the topic? Video Games. For over an hour, I listened these two discuss the latest game they were playing. For roughly 2-3 hours every night, these two fathers sit down and play this game. 2-3 hours every night! After they get off work! The conversation only lasted about an hour before turning to other topics such as their financial stress due to rumors of a loss in employee benefits. 10 years ago, this conversation would not have been so disturbing. Back then, I would most likely have joined them in the conversation. Back then, I was one of them. I spent hours playing games. On top of that, I had a ton of financial worry weighing me down. It wasn’t the only thing weighing me down. I was also about 60 pounds overweight. When I think about who I was ten years ago, I can’t help but be filled with regret. I was drifting along with no purpose. I was wasting one of the most precious resources we are given as human beings. I was wasting TIME. Time, that once gone, can never be replenished. Back then, I had no aim. Of course I had hopes and dreams, but I did not do anything to make them become real. Instead, I turned on the game console and allowed complacency to rule my life. I continued to play as I ate garbage and put on the pounds. My financial well-being never improved, but deteriorated through neglect. Even with a good job, I was not building for the future. What is different between who I am now and who I was then? I started aiming higher. I started hoping for a more fulfilling life. But before I could aim higher, I had to realize I had a problem. I had to become dissatisfied with the direction, or lack of direction, my life was going. And once I became thoroughly disgusted with what I was doing, I started dreaming of ways I could make a change. 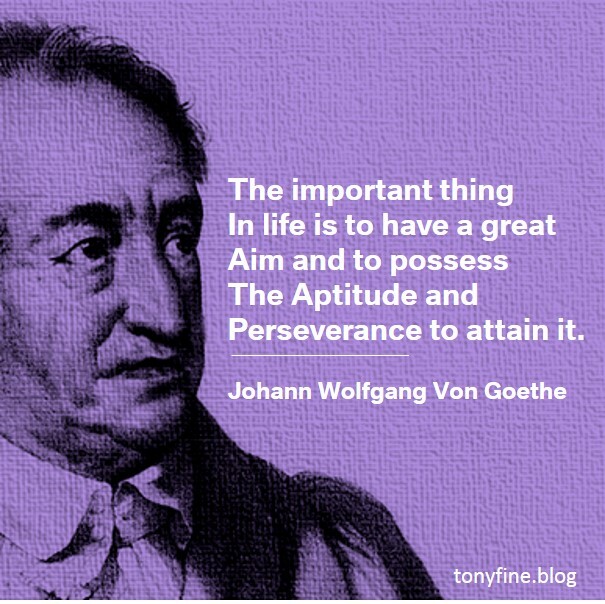 But as Goethe states, aiming higher is not enough. You need to have the ability and the perseverance to change. Change doesn’t happen overnight. It is a process, one that may take place during the course of a lifetime. You need to develop the ability to hit what you’re aiming at, and you need the perseverance to keep swinging until you get there.